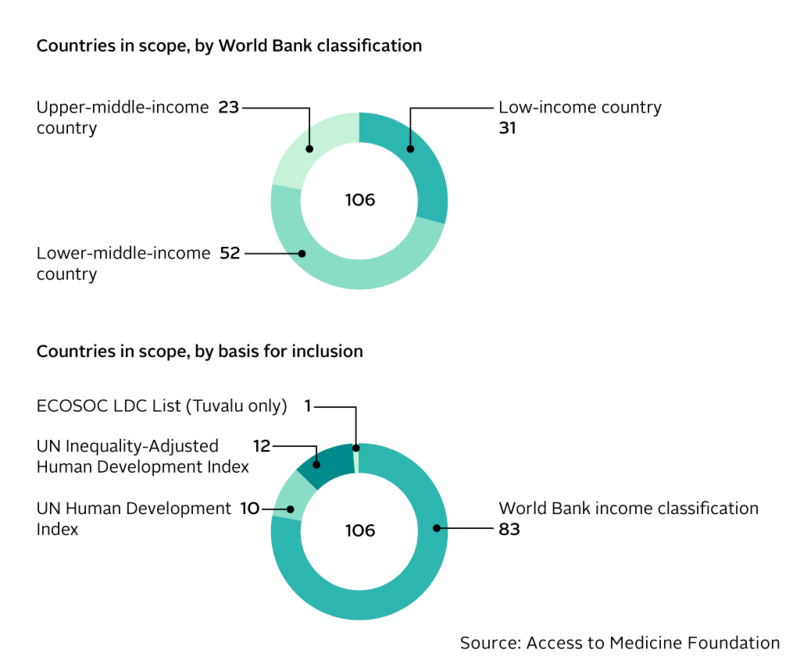 The 2018 Index analyses how 20 of the world's largest pharmaceutical companies are addressing access to medicine in 106 low- to middle-income countries for 77 diseases, conditions and pathogens. Find out more about the scope of the Index research. The Index assesses 20 of the world's largest research-based pharmaceutical companies on their actions to improve access to medicine. Collectively, these companies account for 70% of global pharmaceutical revenues. The global pharmaceutical market was worth USD 768 billion in 2016, and is expected to reach USD 1.06 trillion by 2022. The majority of companies in the 2018 Index have consistently qualified for inclusion since 2008. The companies are selected based on a combination of factors, including market capitalisation and how important their products and pipelines are for people living in low- and middle-income countries. Considering their size, resources, pipelines, portfolios and global reach, these companies have a critical role to play in bringing their products to more people. Pharmaceutical companies that exclusively produce generic medicines remain excluded from the Index in 2018. Generic medicines marketed by the 20 research-based companies or any of their generic medicine subsidiaries in which they have more than 50% ownership are included. The Index assesses pharmaceutical companies in relation to specific diseases, conditions and pathogens. These diseases are the top access priorities for people living in low- and middle-income countries, as defined by the Access to Medicine Foundation through consultation with experts working in global health. For all types of disease the Index looks at, people in low- and middle-income countries face more than 80% of the global burden. The disease scope for the 2018 Access to Medicine Index comprises 77 diseases, conditions and pathogens. One part of disease scope is only included in the R&D analysis. All remaining diseases and conditions are in scope for all areas of the Index analysis. TA = Technical Area, such as R&D or Compliance. The Index covers seven Technical Areas. Cancer is in scope for the first time in 2018: One of the 77 diseases in scope in 2018 is cancer. Specifically, for its R&D analysis, the Index looks at 17 cancers with high disease burdens. For its analysis of products on the market, the Index looks at medicines and vaccines for the 19 cancers with products on the 2017 WHO Model List of Essential Medicines (2017). Nine cancers are in both sets. 2018 Index has expanded its analysis of priority R&D. The Index has expanded its analysis of R&D that targets specific, high-priority product gaps. The gaps themselves have been identified and published externally on five independent priority lists. Over half of the diseases in scope (45 out of 77) have an identified priority product gap. The Index assesses pharmaceutical companies’ actions in countries where better access to medicines is most urgently needed. This set of countries is referred to as the Index’s geographic scope. These countries are home to 77% of the global population, and yet face over 80% of the impact of the diseases in scope. The country scope is defined in four steps: first, include all countries classified as low-income or lower middle-income based on the latest available World Bank data; second, include all countries defined by the UN Inequality Adjusted Human Development Index as either low or medium human development; third, include all high-development countries with an inequality adjusted HDI ratio of less than 0.6; and fourth, include all Least Developed Countries as defined by ECOSOC. The Index assesses pharmaceutical companies' actions in relation to eight product types. The product scope is deliberately broad in order to capture the wide variety of product types available to support the prevention, diagnosis and treatment of the diseases covered by the Index.